The last time I witnessed Foreigner play on Scottish soil, the six-piece, now expanded to seven, line-up took on the might of Styx and came out on top and simply wiped the floor with Journey. Now some three years down the line the Mick Jones led crew had new challengers in the shape of UK AOR veterans FM and a resurgent, and now frequent visitors to these shores, Europe. 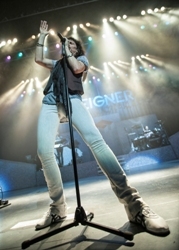 Could Foreigner come up trumps again? Well, they wouldn’t be jukebox heroes if they couldn’t, would they…? Europe however are old hands it this malarkey, so if there was even the merest possibility that they’d be fazed by what had preceded, then it only took around twenty seconds of Joey Tempest’s microphone stand twirling exploits, Ian Haugland’s dynamic drum pounding and John Norum’s muscular guitar work to get the band firmly in the groove. “Riches To Rags” and “Firebox” made for a ferocious opening, and one that possibly took those less acquainted with Europe’s latter day heavy output by surprise, the acoustic led “New Love In Town” proving an easier “in”. Classic era “Superstitious” is always a set highlight and was no different tonight, keyboard player Mic Michaeli who looked every inch the studious Rocker; all long hair, leather jacket and smart spectacles, infusing the auditorium with Hammondy goodness. Tempest is always a confident, engaging frontman and his sharp wit brought much laughter, although it was his vocals on the crowd favourite “Carrie” that gained the biggest response. “Cherokee”, where Haugland even found time to quaff his pint of lager, also revisited The Final Countdown album, as did set closer “Rock The Night”, the latter including a covers section where AC/DC’s “Highway To Hell” and the Stevie Wonder “Superstitious” created a huge sing-along. A brief exit from the stage saw the introduction of a phenomenal booming keyboard intro, bringing the crowd to fever pitch, but for the uninitiated the gritty tones of the best reformed Europe track, “Last Look At Eden”, were a bit of an intense, riff-laden curveball. Although the surprise didn’t last long, with the second burst of boinging keys heralding a house bringing downable “The Final Countdown”, ending a terrific set in perfect style. 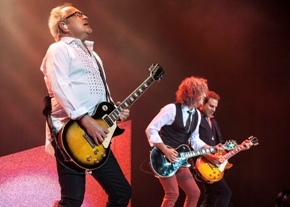 Some may question a band whose line-up contains only one original member, and in truth when Foreigner 2014 hit the stage and played three songs, “Double Vision”, “Head Games” and “Cold As Ice” with no Mick Jones in sight, then the validity of what was on show could well be a head scratcher. What was beyond question though was the quality of the performance and showmanship of frontman Kelly Hansen, a true whirlwind of an entertainer who you fail to be impressed by at your peril. Within the first two songs Kelly had demanded that as many people as possible cram down to the front of the stage, berated those in the front row seats with “wallets too heavy to allow them to stand up – or were they just too old!?! ?” and bypassed the boring punters to stand about twenty rows deep, atop the seat-backs to make sure the stalls were engaged front to back. How his original band, Hurricane, never made it big with this man fronting them, who knows? They had the songs…. Then the moment everyone had been waiting for arrived with “Waiting For A Girl Like You”, Mick Jones striding out centre stage to huge acclaim. No explanation for his delayed introduction was given, so we can only presume it is a case of an elder-statesman wisely pacing himself. 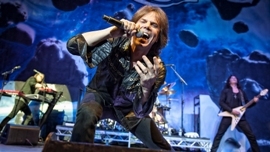 However to be fair to guitarists Bruce Watson (who first joined the band when Jones fell ill mid-tour in 2011) and Thom Gilbel (now with Foreigner for nearly a decade), their performances during the opening trio had genuinely asked the question as to whether this band could one day continue with no original members left at all…. Fortunately “Feels Like The First Time” and “That Was Yesterday” banished any such crazy notions, bassist Jeff Pilson – who is an absolute rhythmical powerhouse – literally bellowing at the top of his voice through sheer joy as Jones strut his stuff both behind the keyboards and guitar. Gilbel then showed his skill with the flute, infusing the vocally awesome “Starrider” with an authentic vibe, “Urgent” powering the show towards the home straight in striking fashion. Drummer Chris Frazier and keyboard player Michael Bluestein then got their chance to shine, the pair using short solo slots well. Bluestein hitting a Jean Michel Jarre like vibe, Frazier pouring water on his drum and cymbals to look like some 80s Metal video pastiche! The grind and punch of “Jukebox Hero”, Gilbel now on sax, Jones imperious on guitar, heightened the atmosphere even further, before a closing encore of “Long, Long From Home”, “I Want To Know What Love Is”, which featured the Scottish Police Choir in a starring role – Pilson even dragging one red haired young lass to the front of the stage to hammer the closing bass lines home – and “Hot Blooded” ended a truly triumphant performance; even if Hansen did just about fall head over heels courtesy of a monitor, in his eagerness to high five as many audience members as possible. With a frontman with more charisma than even a just about sold out venue knew what to do with, a group of musicians with talent and stagecraft to burn and, crucially, some of the best songs Melodic Rock has ever produced, Foreigner really are a sight and sound to behold and tonight Glasgow was held spellbound from start to finish.